The game of billiards has a long and distinguished history, beginning sometime in the 12th century as an outdoor lawn game. It was known as the favored game of kings and statesmen, poets, musicians, and every day folks as well as many nefarious members of society. Over the centuries it has developed into a game loved by all. Billiards tables have become a staple piece of furniture in many family rooms, and in some cases, game rooms are specifically designed with a pool table as the central feature. Often times great care is taken in planning and designing the space the billiards table will occupy, usually with a special theme in mind. Pool tables are produced in a wide range of styles, with materials that can render them affordable, or sometimes quite costly. Whatever the price of the table itself, it is an investment in enjoyment and therefore should be treated as such. Lighting a billiards table is an essential part of that enjoyment. If it is lighted properly, the recreation can be enhanced; improper pool table lighting can lead to frustration. With the large investment of a playing table, the billiards lights become like a piece of jewelry, enhancing the look of the table and the design of the room. Choosing the proper length of pool table light is a very important consideration. Depending upon the length of the table, anywhere from two to five lights can be used. For example, a six foot length table would need 2 or 3 lights, whereas an eight foot table would need at least 4 lights. When installing pool table lights, consider how low the lighting should hang. Too low interferes with the play and causes shadows, making it difficult for a clear shot. Too high and glare can cause irritation to the players eyes. The standard would be 31” to 33” from the playing surface to the bottom of the fixtures shade, or about 63” off the floor. The reference point for where the light should hang would be the middle white diamond of the table, centering the fixture from that marker. A down light should always be chosen when picking out lighting for billiards tables. The fixture should only light the playing surface; it’s not meant to be the center light for the room in which the pool table stands. The choice of pool table lights can be quite exciting, as it can enhance the beauty of the table. To see over 700 ways to light your pool table, with every style of lighting from traditional to contemporary, enabling you to customize your fixture click here. Look over the choices of fixtures, and the shade styles that are offered. 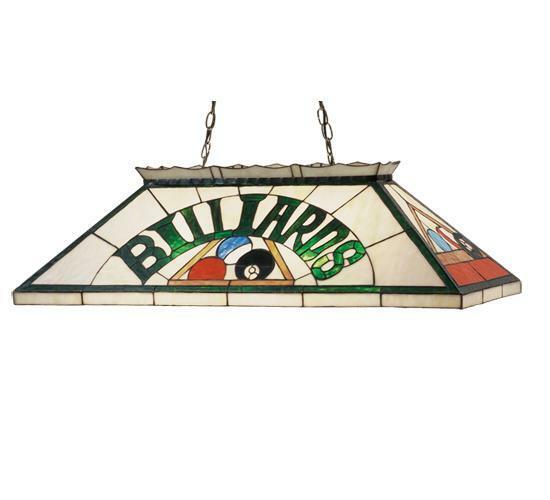 Whether your style is a vintage tiffany glass look, polished metal shades, colorful sleek glass, or modern organza shades, the right fixture for your billiards table is waiting for you. Previous Previous post: What Type Of Floor Lamp Do I Need?